I'm with you. Any dog can be the best dog with proper training and care. It amazes me there are not more Scotties because people stop me all of the time to tell me how cute Molly is. This is my third Scottie and we've had one for over 20 years. 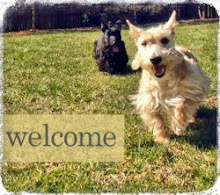 We bought our first Scottie, Sandi MacKay, at a pet store (bad idea!) because she was soooooooo cute. Had her for 14 years. Our second one, Cailin MacTavish, only lived six years because she had diabetes. Now I have Molly McGregor, a rescue that I got when she was two and just before my husband died. She kept me going because she is so loving and so funny. She is never far from me - half the time she is touching me somewhere. I can't even imagine coming home and not having a Scottie there waiting for me with tail wagging! I guess if they have declined in popularity, that leaves more for those of us who love them! i'd prefer it. Regardless, this wonderful breed will always have ardent fans. How could they not? I think that with popularity come puppy mills - you are so right Scottie Mom - we love our dogs regardless of popularity or breed. I was a bulldog mommie before I became a scottie mommy. Our two are so affectionate! They need to be in 'touch', even if it is a little paw or whisker touching you while in front of the TV or in bed (yes, they sleep with the parents). They are our 'children' since the two-legged variety have flown the coop. 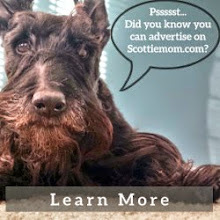 A Scottie is always a conversation opener - nobody can pass those two cuties on our walks without having a pet and a talk. The impawtant people know how pawsome us Scots are! All previous comments have hit the nail on the head. Who really cares what place our precious Scots hold in the "popularity" poll? Not I ! Crab Alley Kate was our first Scot in 1974. Wow! Did she ever teach me about this breed! Angus MacFeeFiFoFum was our second...and now there's Hootie. There is something to be said about their Scottitude but the love and tenderness towards their loved ones - yes, the tenderness - that these guys and gals have is worth putting up with the " 'tude " once in a while. Whoever said a Scottie wasn't a lap dog (on his terms, of course)? I cannot imagine living my life without one of these characters. I hope they never, ever become in the Top 10 - or 20 - because I don't want the breed ruined by over-breeding. And quite frankly, I know what a special guy I have and just plainly don't want to share! I have my first Naughty Scottie, who turned one big year old on Groundhog Day. I grew up a lab person, but became a Westie person when I met my hubby. So two Westies and a Lab welcomed this Naughty Scottie to our home. She is just soooo Scottie! I am so smitten with her, and I have been since the day I met her. She is a Scottie brat!! I am so very glad and thankful she is my baby girl! I will never NOT have one of each. I have a Westie and a Scottie, both are wonderful yet Duncan does have the scrappy attitude when it comes to other dogs such as Boston Terriers and the French Bull's, they bother the heck out of him. But he is loving, funny and so loyal and let's my Westie get the upper hand when they are playing tag and just rough housing! I'm blessed to have both! Mr Winston's stubbornness is a match for my own, and is but one reason to love Scotties. Include Ms Fiona' sweet personality, despite all that she went thru (from what we can tell) and her tenacity to love, as well as their jaunty gait, and I'm a Scotty convert. Boo hiss to those authors...but at least we can hope their writing will contribute to less in breeding. UGA is a perfect product of inbreeding and see the pain THAT has caused? My daughter who works in a pet store bought me my scottie Mac "Dubh" for Mothers Day/Easter/birthday/Christmas a year and a half ago. When I walked in that store and saw him it was love at first sight and when I picked him up and cuddled him he put his head on my shoulder and licked my neck and I was a goner. I never had a dog of my own and let me tell you it has been an experience with this stubborn boy but I wouldn't trade one minute of it. We have since welcomed a sister for our Dubh who is a Scoodle...same story but my husband saw her. Went into the store for bully sticks and came out with Miss Bella...she is a fiesty bugger. Her mommy is a scottie and her daddy is a toy poodle. She has the scottie stubborness and the yappiness of the poodle. She looks just like her brother but on a tiny scale...she looks like his mini me...LOL I don't think I would never not have a scottie again....I love them so much. Also in our house we have a great dane puppy and a mini schnauzer (my daughters) and they all play wonderfully together. Never owned either an Italian Greyhound or any kind of fox terrier, but I had English Setters years ago. Great dogs, but they need to run -- really stretch out and go top speed for a distance -- at least while they are young. They are not city or tiny suburban backyard kind of dogs. They just aren't here in Arizona. I see a new one about once every 3 years. I like the nature of all Terriers - they are special in all ways. I so agree with you both about the touching and the conversation starter. When I'm looking for her she is usually within 2 feet of me. When I walk her people constantly stop to visit -- except for those who avoid us like the plaque because she's barked at them! Love my Scottie! The sentence is old , from Francis G Lloyd , any dog is good , a Terrier is better, the Scottish is the best . 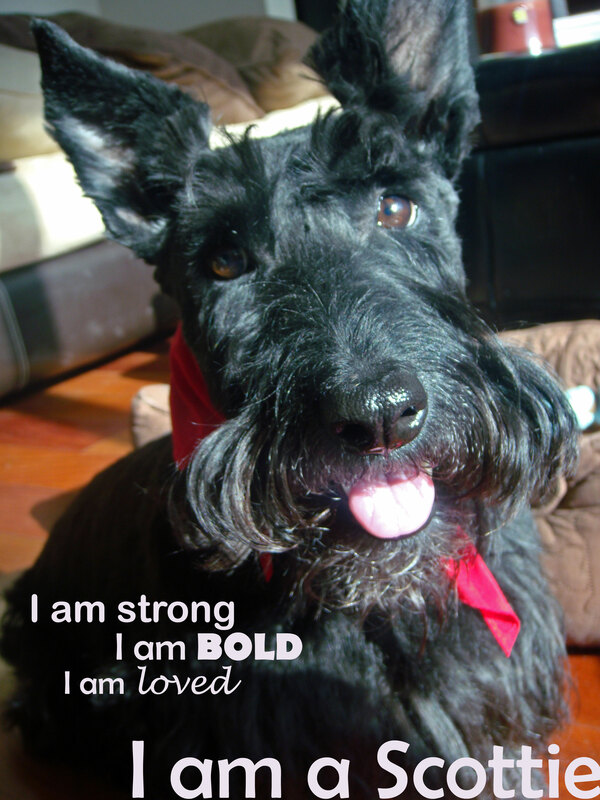 Scotties are for special people that understand and love the big dog living in a small body .